Hundreds of millions of people around the world have discovered this marvelous “path” because of Jesus’ death on the cross and His bodily resurrection from the dead. At physical birth one receives many things he is not aware of: family name, privileges, wealth, love, care, and protection. At spiritual birth one becomes a son of God and receives eternal life, a divine inheritance, and God’s love, care, and protection. God has given us these because of His great love. God’s gifts are never based on man’s changing emotions, but on His own unchanging word. In your own words, describe what you have, according to these verses: Ephesians 1:7, Romans 5:1, Romans 3:22, Colossians 1:27. There is a throne, a control center — the intersection of one’s intellect, emotions, and will — in every life. Either self or Christ is on that throne. Let me illustrate. I became impatient. Couldn’t my associate see that we are in a war for men’s souls, that we must seize opportunities when they arise and not limit our efforts to 8-to-5 workdays? I made my point clear to him. I could tell that my colleague was frustrated. But I reasoned, We need those printed materials. Whatever it takes, we need them. Within a few moments after our conversation, I sensed the conviction of the Holy Spirit. Yes, even in our well-intended service of the Lord, we can stumble — and in the name of godliness I had offended a dear brother in Christ. I had failed to give him and his staff the benefit of the doubt — failed to take into account the tough workload they already were facing each day. On the one hand, I could let it go. After all, doesn’t the head of a large organization have the right to ramrod projects through when necessary? Didn’t the end (the strategic international conference) justify the means (get the job done no matter what it takes)? And didn’t my associate’s hesitant attitude warrant a stern talking-to about the urgency of the hour? I drove down to the office complex where my associate and his team were located and asked their forgiveness. We cried and laughed and prayed together, sensing a fresh outpouring of God’s love in our midst. Then we talked through our mutual needs and found a way — as teammates — to rearrange priorities and accomplish the task — on time! 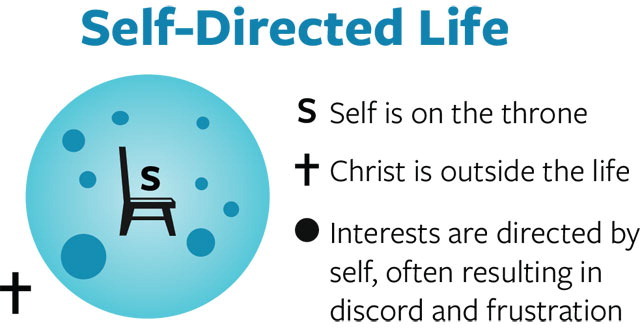 Many people have misconceptions about the Christian life. Some argue that once they have received Jesus Christ into their lives by faith, it is up to them to live a life pleasing to God in their own strength. Others believe that Christ has entered their lives to help them live and work for God’s glory. These ideas of Christian living look good on the surface, but each contains a weakness that actually undermines the basis of vital Christian living. “The great difference between present-day Christianity and that of which we read in these letters is that to us it is primarily a performance, while to them it was a real experience. We are apt to reduce the Christian religion to a code, or at best a rule of heart and life. To those men it is quite plainly the invasion of their lives by a new quality of life altogether. They do not hesitate to describe this as Christ “living” in them. Today when a person places his faith in Christ, Christ comes to dwell within him by means of the Holy Spirit (Romans 8:9). His purpose for dwelling in us is that He might live His life through us. Many Christians are trying to operate on their own finite ability instead of Christ’s infinite power. Have you ever asked yourself, How can I experience the victorious life of Christ? To find the answer, let’s examine the three types of persons in the world today: the non-Christian (natural man), the spiritual Christian, and the worldly or carnal Christian. In I Corinthians 3:1-3 the Apostle Paul addresses the Christians as “worldly,” rather than spiritual. The following diagram represents a life in which the person’s ego has asserted itself. Self has usurped the throne of the life, and Christ has stepped down. The result is the loss of the individual’s fellowship with God though he is still a Christian. Describe the worldly Christian as presented in I Corinthians 3:1-3.Name five or six practices that result from worldliness. (Galatians 5:19-20)Summarize in your own words the relationship between the worldly mind and God, as described in Romans 8:7. You made the most important decision of your life when you chose to receive Jesus Christ as your Savior and Lord. At that moment you were born into God’s family, and you received everything you need to live the abundant Christian life. But that does not mean you are as spiritually mature as someone who has walked with Christ for many years. The Christian life is a process that begins with an act of faith and is lived by faith. What do you suppose would happen to a child who doesn’t grow properly in his physical body? In his emotional life? In his spiritual maturity? Just as physical life requires air, food, rest, and exercise, so does spiritual life require certain things for growth and development. This lesson deals with five principles of Christian growth. The first two, We Must Study God’s Word, and We Must Pray, help us deepen our relationship with God. This could be called our vertical relationship. Through the Bible, God communicates to us; through prayer, we communicate with Him. The next two principles, We Must Fellowship with other Christians, and We must Witness for Christ, help us reach out to others. This could be called our horizontal relationship. In fellowship, we communicate wth other Christians about our Savior and the bond He gives us with one another. In witnessing, we communicate with non-Christians. We tell them about Jesus, what He has done for us, and what He desires to do for them. Principle Five, We Must Obey God, is the core of growth. As we obey Him, we experience increasing joy, peace, and fellowship with the Lord Jesus Christ and fellow believers. We also become increasingly more mature in our Christian walk. If you follow these principles, you can be sure that you will grow toward maturity in Christ. You would not think of going without physical food for a week or even a day, would you? It is necessary for physical life. Without food, we become weakened and eventually may become ill. Lack of spiritual food produces the same results in our spiritual lives. Jesus said, “Man shall not live by bread alone.” How did He say we should live and be nourished? (Matthew 4:4) Have you applied this to your life? Describe how it nourishes your spiritual life. List the two characteristics of the workman God approves, according to II Timothy 2:15. What steps have you taken to make these characteristics true in your life? What did Jesus say about those who read and believe God’s Word? (John 8:31-32) What does this mean to your way of life? When does the man who is spiritually mature meditate on the Word of God? (Psalm 1:2-3) How can you do this in our hectic, pull-apart world? In what specific ways do you expect God’s Word to affect you? Have you ever considered that you have immediate access to the most powerful Person in the universe? Whatever you need, whatever the time, you can call upon Him. His calendar is cleared to be with you. His schedule is open for your appointment; His full attention is devoted to you. What was Jesus command in Matthew 26:41 and why did He command it? Why did Peter fail to resist temptation? What is the most serious result of Peter’s prayerlessness? Think about your own life. What has been the result of prayerlessness in your life? How did Christ experience inner power to face the severest test of His life? Prayer without ceasing involves conversing with our heavenly Father in a simple and free way throughout the day. Our prayer life should be such that we come to know the Lord Jesus in an intimate, personal way. Our prayer life becomes effective as our relationship with Christ becomes more intimate. List ways you can increase the amount of time you spend in prayer. Fellowship is spending time and doing things with others who love Christ. Several logs burn brightly together, but the fire goes out if one is placed alone on the cold hearth. In the same way, Christians need to work together or the fire of enthusiasm will go out. Fellowship is vital for Christian growth. That is why active participation in church is so important. According to the above verses, what should we do for one another? In what ways have you done them recently, and for who? The new believers in Acts 2:42 continued steadfastly in what four things? Why is each one so vital to spiritual growth? In what ways do you profit from Christian fellowship? Be specific. Why is it important that a Christian be part of a small group with other Christians sharing the Word of God? 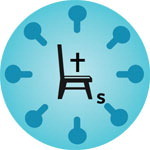 Why is is necessary to work out conflicts with members of your Christian circle? What can happen if you don’t? A witness is a person who tells what he has seen and heard. He shares his own personal experience. Anyone who has a vital personal relationship with Christ can be a witness for Him. Witnessing is the overflow of the Christian life. A vital Christian life is contagious. As our lives are filled with the presence of the Lord Jesus, we cannot help but share Him with those with whom we come into contact. In Romans 1:14-16, Paul tells us his own attitude about sharing the Gospel with others. Using his three “I am’s” as the keys to the passage, describe his attitude in your own words. What did Peter tell us in I Peter 3:15 that we should always be ready to do? Where and when can you do this? What was Jesus’ promise in Acts 1:8. How is this promise shown in your life today? Name at least three people to whom you are impressed to witness to in the power of Christ. Prayerfully ask God to show you ways to share your faith in Christ with each one. It is the privilege and responsibility of every Christian to reach his world with the message of Christ. The key to rapid growth in the Christian life is obedience to the will of God. Knowing the principles of growth is of no value unless we actually apply them to our lives. To be disobedient to the one who loves us and who alone knows what is really best for us would be sheer folly. Remember, He is even more desirous than you are that you have an abundant life. How can you prove you love Him? (John 14:21 ) How have you done this today? This week? Where do we get the power to obey God? (Philippians 2:13) What happens if we try to obey God’s commands in our own efforts? In light of Luke 6:46-49, why do you think obedience to Christ is imperative for your life? List the five key principles of Christian growth, a key verse relating to each one, why it is essential to spiritual maturity, and at least one way you can apply each principle to your own life. Before I became a believer in Jesus Christ, God’s Word did not make sense to me. I occasionally tried to read it during my high school and college days, but found it boring. Finally, I concluded that no really intelligent person could believe the Bible. My life was transformed, and my attitude concerning the scriptures changed. I realized the Bible was the holy, inspired, and eternally authoritative Word of God. Not only is God’s Word divinely inspired, but it is also the basis of our belief as Christians. It gives us God’s perspective on how we should live and how we can be fruitful witnesses for our Lord Jesus Christ. The Bible is God’s love letter to man. From Genesis to Revelation, it tells of God’s great compassion for us and of His desire to fellowship with us. Furthermore, the Bible reveals God’s attributes. It tells us that He is holy, sovereign, righteous and just; that He is loving, merciful and kind; that He is gracious, patient and faithful; that He is powerful, wise, and constantly available to His children. And the more we read and meditate upon His precious Word – and allow His Holy Spirit to control our lives – the more fruitful we become for our Lord. Because God’s Word is truth and “sharper than any two-edged sword,” it is impregnated with the power of the Holy Spirit to speak to today’s world and our own personal needs and circumstances. Ultimately our view of the authority of the Bible and of the incarnation of Christ are related. In John 10:34-36, for example, Jesus taught that the Old Testament was totally accurate. In Matthew 4:4-10, He quoted it as being authoritative (Matthew 24:35). He even told us that the Holy Spirit would bring to mind what He said so that the disciples would preach and write accurately, not depending upon only memory or human understanding (John 16:12-15). A high view of inspiration should be related to personal Bible study and meditation. As you study this lesson, I urge you to apply the principles that you will learn about God’s inspired Word to your life. Let God speak to you and invite the Holy Spirit to transform you into a joyful and fruitful Christian. What were the attitudes of the following prophets concerning their writings? Isaiah 43:1-12, Jeremiah 23:1-8, Ezekiel 36:32-38. What were the attitudes of the following authors toward other writers of scripture? Paul (Romans 3:1-2), Peter (II Peter 1:19-21), The writer of Hebrews 1:1. If the writers had this high regard for scripture, how should we view the Bible? What part should God’s Word have in our lives and in the way we evaluate and react to circumstances and events? Name some of the practical results of a thorough study of the Word of God. 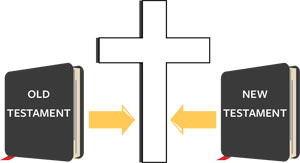 (II Timothy 3:15-17) What changes have you seen in your life from your study of the Bible? In Acts 20:32, Paul says that the Word of God is able to do what two things? What should be the effect of reading the Word of God on your own life? (James 1:22-25 ) Think of a difficult circumstance in your life. In what ways is reading and meditating on God’s Word helping you cope with the situation? How are you applying God’s Word to the problem? Set aside a definite time. When did Moses meet with God? (Exodus 34:2-4 ) When Did Christ meet with God? (Mark 1:35) What is the best time for you? Find a definite place. Where did Christ pray? (Mark 1:35) What is the value of being alone? Employ these tools: Modern translation of the Bible, notebook, pen, dictionary. How can you use these tools in your Bible study? Observation: What does the passage say? Read quickly for content. Read again carefully, noting key words and phrases. Interpretation: What does the passage mean? Ask God to give you understanding of the passage. Consult a dictionary or modern translation for the for the precise meaning of the words.Ask: Who? What? When? Where? Why? How? Study Luke 19:1-10 , and apply the Bible study method you just learned. How effective will this method of Bible study be for you now with other scripture passages? What changes in your life do you expect as you proceed with more in-depth Bible study? Plan your Bible study time for the next four weeks. Write down the time, the place, and the passages to be studied. Communication is a vital element in any successful relationship, including our relationship with God. He wants us to communicate with Him about our cares and concerns. He desires that we talk to Him about every area of our lives. This communication with God is called prayer. Because the one to whom you pray is the King of Kings, and Lord of Lords, the Creator of Heaven and Earth, you come into His presence with reverence. But He is also your loving, heavenly Father who cares for you. Therefore, you can enter into His presence with a relaxed, joyful heart, knowing that God loves you more than anyone else has ever loved you or will love you. Since prayer is communication between two persons, it can also be described as a dialogue. Write a sentence about the part each of these have in a dialogue between the believer and God. What vital elements of prayer are found in Acts 4:24-30. What are some of the elements that Christ included in His prayer in John 17. Set a time and place for your daily prayer time. Use a small notebook to help you pray effectively. On page one, make a list of people whom you want to remember daily in prayer. On page two, write a list of things for which you will praise and thank God. Update the list daily. On page three, write the date, prayer requests, and scripture verses related to requests. Leave room to write down the answer and date for each request. Each day, repeat the first two points, checking for answered prayers to record on earlier days. Keep this notebook with your Bible so you can refer to it during the day to pray for and record concerns, needs, praises, or thanks that come to mind. Of course, the child’s perception that God lives in a single, physical place is incorrect. Nevertheless his statement is profound: God does live in His church – the company of all who believe in Jesus Christ and have received Him as their Savior and Lord. In a broad biblical sense, the church is the body of Christ – the collection of Christian believers from all over the world and from all times who are bound together by the shed blood of Christ and His resurrected presence. In our local congregations, we play an important part of the body of Christ. God wants us to work together so that the church body can minister to others more effectively. The church also is a unity of the Holy Spirit. Although doctrinal differences often separate Christian groups, they are united in the fact that Jesus paid the penalty for our sins by dying on the cross, and He rose from the dead that through Him we can be reconciled to God. The outreach of the church is worldwide. When our Lord’s earthly ministry was completed, He commanded the church to carry His good news to the world. By sharing our faith in Christ, we are helping to fulfill His Great Commission. I am convinced that a proper understanding of the church and how it is to function as a local body is important if we are to be fruitful disciples for Christ. Some time ago I struck up a conversation with the passenger sitting next to me on a plane flight. As we talked, he was very cordial and pleasant. Than I asked, “Where are you on your spiritual journey?” Suddenly, he became defensive. Before I became a Christian, I used to believe that the church was filled with hypocrites. Now I recognize that many people go to church – not because they are perfect – but because they need help. The church then, in the vernacular of the business world, is a repair shop, not a retail store. The church is not perfect, but it is the institution that offers hope and healing in any community or culture. It is how God reaches out to others with His love and forgiveness. I urge you to study this lesson prayerfully and carefully. As you continue in your study of the Bible, search out passages that describe the church and its ministry on earth. Keep a diary of your studies for future reference. What did the early Christians do that we should do also? (Acts 2:41-42, 4:3, 5:41-42, 8:4) List several ways you can apply these to your Christian walk. As God’s children, how do we obey the instructions given in Hebrews 10:25? Read I Thessalonians 1:1-10 then list here some qualities God desires in members of any church. In what ways do you demonstrate these qualities? What do you believe baptism accomplishes? (Matthew 28:19) Who is eligible for baptism? What was the significance of your baptism? How do you prepare yourself to observe the Lord’s supper? What should be one of the basic purposes of a church? (II Timothy 4:2) How does the church you attend fulfill these purposes in this verse? List several of your own reasons for joining a church. What should the church believe about Christ’s birth? (Mathew 1:23 ), Deity (John 1:14 ), Death (I Peter 2:24), Resurrection (I Corinthians 15:3-4), Second Coming (I Thessalonians 4:16-17)? Where does your church stand on these truths? It may be helpful to obtain a doctrinal statement from your church and research these areas. Which of these roles do you fill? Which would you like to be involved in? Why? How are your preparing yourself for that ministry? If you are not already active in a local church, prayerfully list two or three that you will visit in the next month, with the purpose of attending one regularly. Before you attend the first service, list the qualities you feel are essential for spiritual growth and fellowship. Ask God to show you which church He is leading you to join. If you are part of a local church, ask God to show you ways you can be more used by Him in the church. List the ways of service that He reveals to you. Bow for silent prayer before the service begins. Pray for yourself, for the minister, for those taking part in the service and for those worshiping, that Christ will be very real to all, and that those who do not know Christ may come to know Him. Always take your Bible. Underline portions that are made especially meaningful by the sermons. Take notes on the sermon and apply them to your life. Can you list some other ways?